Invisalign® is an orthodontic technique using transparent or invisible trays that are custom made for each patient and allow for orthodontic corrections by progressively moving teeth. A series of invisible (transparent) trays are fabricated from models of the patient’s malocclusion (dentition to correct) and these trays are changed at regular intervals until the final position of the teeth is reached. Alignment trays are also called “gutters”, “transparent occlusal plate”, “occlusal splint” or “invisible dental appliance”. The main advantage of Invisalign® trays is that they are less visible; indeed, this technology does not require the use of metal wires or orthodontic brackets. However, this orthodontic technique and these dental appliances do not allow the correction of all orthodontic problems. 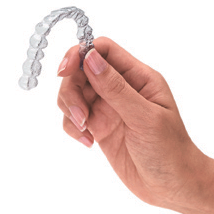 To see examples of Invisalign® treatment. It is now possible to get straight teeth without metal! Ask us if you are a good candidate for this type of treatment. Invisalign® is the undisputed leader of this revolutionary new technology (from the early 2000s), which uses a series of trays (gutters) or removable aligners made of clear plastic to gradually move your teeth according to a custom made prescription for each patient. Thus, this allows you to smile without having visible braces during your treatment! You can see, even before the beginning of the treatment, the final corrections programmed in your aligners. You will thus know the expected result.